As the sun descended gracefully into the shiny stream tapering into the foothills, I realized that my time with the Commander was slowly coming to an end. The 50-year-old “progressive” thinker, who sat on the rock, looking at the orange hue make way to the purple ones, and listening to the subtle chirps of the birds returning to their nests, seemed lost in his own thoughts after replying to my question in his own fashion. A fashion which struck me as an oddity when I first stepped out in Hindolera Kampa, from the Tata Safari which tediously brought me and my friend, Ganesh, from Bastar headquarters. A progressive thinker, full of quick sharp wit, and filled with idealistic philosophies of world socio-economic strands, Commander Lathvir, was a great company to have. Someone who represented a rather flawed but true imagery of often radically termed People’s Liberation Guerrilla Army (PLGA) based out of the forest state of the nation, Chhattisgarh. As I sat down contemplating the ideologies which make and break a society, a slow rumble of a thunder barked across the sky. Rains, as the Commander had said many hours before, never went dry here. One less thing to fight for, he had concluded earlier. What is Society? In a manner of discussion and introspection, we often ask ourselves this very basic question. What does the definition of society actually implicate? Is it just the conglomeration of comfortable and inspiring ideologies, or is it a set of convenient living practices? A group of people, if you will, making choices which resonate with their idealism and constructive behaviour. Is that what we call a Society? When we are faced with these questions, often at times we tend to lean towards the accepted ideology of sustainable and peaceful living. Peace, as in the word and verb, becomes truly important to us. Once that is established, we begin to extrapolate factions of individuals, who present an idea which seeks to disturb the peace. Our primal fear is not the violence of presenting a peace altering idea, but the fact that scares us is the effort it might take to reform the peaceful establishment. The trails try and tire us. Isn’t this why we avoid accommodating ideas which challenge our life, ideas, political stands, economic class and our beliefs in them. In this following article, we dabble with many such ideas, philosophies, questions, and suggestions which cut deep into our framed structure of a positively ideal society. The article formulated in the discussions, between the writer, and his interviewee, Commander Lathvir, try to understand our stand as a society from the perspective of a clan which is slowly losing hope on it. The article is not just about the Maoist regime, its formulation, its upbringing, the political standpoints, the brutality of wars or the thousands of lives lost. 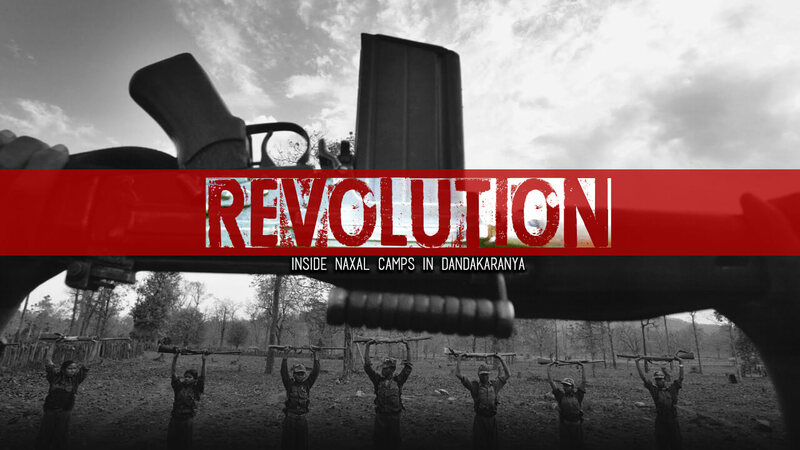 But this article, termed Revolution for a purpose, stands to understand the ideology at a conscious level which makes people let go of a well-functioning society, and armed with rage and hope in their hearts makes them India’s most wanted armed rebels. Ganesh and I are blindfolded as soon as we get off her boarding vehicle. It is around 5.30 in the morning, with dense cold fog still in the air, and occasional howls of wolves still to be heard occasionally. We are met with four armed cadets, who ask our driver to politely get off the car. He is then accompanied by another cadet to an opposite direction before we are blindfolded. From the spot of our arrival, we are to walk to the inner settlement at Hindolera Kampa, where our talks have been arranged. Ganesh’s active journalist’s ID and mine redundant ironically works in our favour. The Rebels have talked and talked more with the media, only to be misrepresented all through. At least, my blindfolded companion tells me that. Who are we obviously to take a stand on what is right and what is not? As we walk through the leaves and spines, smelling a thousand different scents of wildlife, and wetness of the ground, we already know that the journey will be fruitful than most, at least from a journalist’s point of view. We are finally untied of our blindfolds after an hour of walk. We open our eyes to look at a decent dwelling of huts and tents, in a vast clearing made somewhere in the middle of the Dandakaranya. The local tribe inhabit it, presumably, as most of the early risers walk past us, women filling their pots, men chewing their tooth sticks, with a curious look on their face. The four cadets walk in front of us, ask us to closely follow them. We cross a dozen speckled huts, and their make-do stick and thorn fences, through which hens and rabbits jump out and around, to reach another inner ring of huts. It is not a dwelling; I stand to realize. This in itself is a village. A village, I am told later, built and protected by the Rebels. Ganesh and I, are asked to wait in a hut, as one of the cadets, offers us water in small earthen pots. As a couple of journalists who’ve known each other for a while now, I knew that Ganesh though not stating the obvious, was thoroughly excited about doing this interview. For someone who was terrified by the slightest rumble of the clouds, the guy was doing just fine with the lashed out rains. As we sat waiting, we rechecked our list of questions one last time. Obviously, we weren’t carrying our phones, or ‘any other’ kind of electronic appliance. This was clearly instructed to us, beforehand itself. Our questions were carefully designed to extract as much information about the present Maoist regime in the states of Chhattisgarh, West Bengal and Andhra Pradesh, and intended to bring new information about the Rebel party’s future in the nation. As soon as Commander Lathvir entered the hut, he asked us to tear out these questions and throw away. Recently at a press conference to initiate “Sankalp Se Siddhi” the Chief Minister of this state, spoke about ending Naxalite movement within the RedBelt by 2022. A joint commission for the same has been established and activated since the last few weeks. In addition to this, CMO of Jharkhand has recently spoken of an interesting idea of the implosion of Naxalite movement, and anticipate its extinction in a couple of years. With these in mind, let me ask you, Commander, what are your thoughts on it? Is world sinking small for the Rebels to explore? “Did the paper you brought here contain simpler questions? Haha…” laughs the rebel army head at my questions. I invite the laugh with a smile too, but I am interested in the answer than the humour of it. He realizes that I am waiting for his response, and mellows back. “Next question please..” he says, as one of his cadets brings in a small paper cone of boiled peanuts. He offers me some, which I politely refuse. Do you not think this question is relevant? May I know the reason why you wouldn’t want to answer this? Errm, see the statements by a politician can and should never be taken seriously. They are myths and propaganda. Why do I need to justify something which is spoken out of spite? The idea that they are bringing an end to something, always makes people happy and comfortable. Hence, by speaking or answering to it, I need to believe in some part of it. Sadly, I don’t. Hence the next question. If not for the propaganda basis, could you humour this question coming from someone like me, a normal part of the society? The question is whether we are going extinct, isn’t it? (yes.). Maybe we are. As a set of thoughts causing our rebellion, maybe what you ask is valid. Thoughts of the early 19th century, in establishing Communist culture across the globe, have gone through a paradigm shift. They have become more in tune with the present times. It is no longer about the establishment of an ideology, but rather about protecting it. Propagation has given way to protection. So maybe the present state of things will go down, and a new form will be taken up in its stead. But how can you stop the fight? How can you overlook the persistent injustice? How can you be calm when poverty, corruption and politics keep you pushing into a storm? So no, the fight will never stop. When you say another form Commander, do you think the movement is finally at a stage to step out of these dense forests and make way to the society, with a hope to bring revolution within the society? The working committee of Communist party would be a better fit to answer this question, comrade. However, I can only say that we do plan to establish resolute culminations of educational groups across the state. We are working on obtaining licenses for establishing our own university in Raipur and Bhubaneshwar. …becoming apparent by the day, education of idealistic reforms become an important part of going forward. We plan to run these universities on a free basis, with grants from the government. Most of our regiments might be dissolved in the process and absorbed into these universities, which will offer degree courses also. As part of “Surrender and Rehabilitation” procedures, we shall be letting a large part of our candidature accept that we have a bigger role to play in reformation techniques. We are being misunderstood. And we collectively think by inculcating education for the same we shall be giving an alternative for the society to choose a life beyond thus defined by Capitalism, or should I say a more radical Consumerism. Other plans that we have included are, establishing regiments for the help of the poor and downtrodden in states like Haryana, Madhya Pradesh and more. So as you can see, we are just splitting one strand of hair into three. It’s of the same make and the same head. Then when you say the same of three, the question is why so? We do not want our influences or prejudices to affect the educational wing that we want to establish under “Siksha Abhiyan”. Much like how our political agendas shall not interfere with our revolution, under Common Man Army. Rebellion is different. Upliftment is different. Each needs to have its own sanctity protected. Continuing in the same thought, If I may, In 2011, right after the Human Rights Commission’s report, your party outfit stated that education by the movement, had failed to zero in on a neutral education, which didn’t lean towards the Leftist ideologies. Given so, how do you wish to do it this time around? We still abide by what it says. Yes, we did provide education which was markedly communist. What is wrong with it? We still want to do so. In our democracy, we are given a choice to adhere to any ideology as long as it does not violate the peace of our society. Irony don’t you think? Haha. Democracy is required to propel Communism. But yes, which academic establishment is free of any ideology? These business schools, teach you to be ruthless capitalistic pawns and players. On the other hand, we are just teaching about society and world. How are we wrong and they correct? When did philosophy become a limitation than strength? That itself is the foundation stone for a sustainable nation. Capitalism brought the Crown into power and reduced them to nothing today…..
..One can make that argument with the Soviet Union don’t you think? The thought of Lenin brought glory but the test of time failed it? Communism in its restrictive manner and detached ideology became redundant yes. But since you take the name of one of the greatest socio-political commentators of this century, I need to say that the idealism of people never changed as envisioned by him. He was wrong perhaps in assuming a sort of timeless propagation of idea, but not with the idea itself. ..Does Communism work in a timeless way? Is it, therefore, borrowing its change-absorbing traits from Democracy? And sir, do you believe in Democracy at all as an academic theory? If a billion people are following it, then Democracy is something we ought to have an understanding about. There’s no doubt about it. But then again a much larger portion of world’s population believes in some sort of Messiah sort of figure who will uplift their lives. So you see, following an idea or ideology even by the largest of masses, doesn’t make it the sustainable solution. It might be a temporary reprieve. A comfort in a crowded situation. Communism, on the other hand, breaks the comfort zones of an establishment and thereby faces slow acceptance. Democracy is easier to follow. Like your religion and mine. And what is easy is always preferred. Communism is a bit strenuous but effective. As the day comfortably shone above the grass blades at the hut-tops, and as the drizzle continued to threaten a bigger surprise, Ganesh, visibly drenched, stepped back into the hut, after his initial round of interview with the locals. He flipped close his notepad, in which he had scribbled his findings and sat in another corner. The Commander spoke to a comrade and within moments we were given small earthen cups of warm milk. The Commander walked to the opening of the hut and looked out intently at the rains. After a moment of silence, he started cracking jokes with other cadets. The local dialect was something unrecognizable from the Hindi, in which we were conversing till then. I gulped down the milk and walked up to the opening. …What justification can one seek for the Sukma incident where 25 policemen were killed? Will the Rebel army take responsibility for it? (Commander was a bit startled to hear my voice, or was it the question? Who knew?) A bridge which connects the corrupt leader’s lands, and makes them economically the richest areas around? When the tribal populace is left in the lurch owing to no communication and connection to get their daily food. Do you think that’s fair? What kind of development is this? …Do you sir, take this responsibility? 25 Policemen, is not a small number? Neither are the hundreds who will starve to death. Neither are the lives of the people killed every year. True understanding is in the way of presenting our image to the public with respect to media. Did any single media channel cover the whole picture? Did they tell you who owns the land on which the construction was done, or our demands in a proper manner? Tribals own the land. 356 tribals were uprooted for the construction of the bridge. Our talks with the local leaders of Bishkoi tribe and more told us that more than 60 were killed for refusing. Where’s the media then? …Does that justify, Commander this brazen act of violence then? An eye for an eye? When you have a billion people in support, and cash-rich government which prides itself on power, how do you justify the displacement? Our killing was just reactionary to the incident. We are the people they affect. Government is the biggest joke in this forest. Did you, young friend, see any policeman ready to accompany you into these forests? The denser the forests become, the weaker the hearts of the diplomatic men become. You asked why we went with the three strand model. This is exactly why? The Communist Party cannot just be judged for… (A couple of children run past us, as we started to get involved in a discussion which is either of us knows, might lead to only one conclusion about our society. The children happily ran past us, as the drizzle turned into a thunderous downpour) …its radical yet necessary methods. We are not propagators of violence, but just an army protecting our own. As the nation does, at its borders. Would you call that violence? The Commander stepped back into the hut and signalled me inside. He looked at Ganesh who was now sniffing with a slight hint of cold. The dew, fog and the rains, could affect the best of us. And for someone like Ganesh, who worked in a national press media, and in an air-conditioned cabin, the change was effectively startling. I signalled to him, if he wanted to talk to the Commander and if I needed to take a break. He nodded in agreement, and I sat decidedly away from the official journalist. Ganesh and Commander Lathvir’s discussion might pop up as a puff piece in a newspaper soon. Although I wasn’t very impressed with the questions, there were aspects of their discussions, which were quite interesting. He had done his homework. It was only sad then, that the newspaper he worked for was government funded and he would eventually use much less of his effort here. As Ganesh proceeded with the interview of leader, I chose to step out and talk to the cadets. Getting their stories in the mix was important not just for the overall comprehensive structure of things, but also for justifying the radicalism of choice. My first interviewees were two friends, Gora and Suraj, from the nearby village of Jopuraka, who had joined the movement some seven to eight years back. My question to them was what anyone would ask a couple of youngsters who seem to have been truly motivated for a change in the status quo. What made you join the movement and come here? Suraj and I have suffered because of tyranny. Suppression also. We don’t have food in our village, no electricity, no government official comes to our lanes, nor does a doctor. We get a disease, we die. It is simple. Suraj lost his father when he was five years old, and his mother when he was fifteen. Both suffered from cholera, which we knew later. The only way he could reach the nearest town was through a horsecart, but he couldn’t afford one. As for me, after my father started beating us, me and my sister, both have joined the movement. We met Commander at our village and he showed us that we were not useless. We could be useful. What about Education? Have you had the opportunity? ‘Prabhala’ schools within the forest were burned down in the last elections, so since then, we couldn’t get much. My sister surrendered last year, and she now lives in town. We visit her sometimes, and she gives us simple books from her college for us to read. I haven’t read anyone of them..hahah. But I am glad that she is getting her degree. Suraj writes poetry sometimes in our own dialect. We try to convert them into Hindi sometimes just for fun. (Suraj smiles, and passes on a beedi to the both of us. I take it to be courteous, but I feel something strange about this conversation. The more I talk to them, more I feel it a bit unnatural. Something is still amiss). What do you two, want to do in this movement? What is this movement about for you? It is liberation. It is freedom. It is our chance. And for our villages and people. Our chance to get more opportunities. To get a better education, and for our brothers and sisters to get the best health facilities. We want our future generations to have a meaning better than ours. To come to the cities and live away from the forests. Why can’t you do the same? When you desire a better life for your children, why don’t you give up on the arms and take up the surrender packets? We don’t want to. By our leaders in the national political forum, we are being taken care well. We don’t lack for anything. But it is our life. A life we have seen and known. We know each twig and each marker. We know which fruit is to bite and which one is to kill. This is our home. If we give up on the tribal here, they will be entirely oppressed and sometimes killed. Things are looking good. With a new commission for Surrender and Rehabilitation Packages, we are hopeful that, not just monetary benefits but reservations in academic qualifications are provided. Don’t you think in the present scenario of “Terimoli Board” branding your outfit as anti-social, you are looking out for an extraneous demand? That I am hopeful they will change. Our Communist party is trying to change the status and we believe it will happen. We are just simple people standing up for our rights. How does that make us anti-social? If you ask what is rightfully yours, you become anti-social, I don’t understand? Just a few minutes past one in the morning, three convoy jeeps traversing the road veining across the Dandakaranya, were unceremoniously stopped by pelted stones and gas bombs. The basic rule in this part of the RedBelt was never to stop in spite of any threats. The trick was to keep going, and the drivers of these jeeps knew this by heart. The stones became larger and the hits became harder, as the jeeps gained acceleration for life. The convoy was carrying Additional Tahsildar (SDM) Kamlesh Naik, who along with his security and Nayab Tahsildar Larkoin Momba. The reason, of course, these two gentlemen took the risk of travelling via the thickest portion of this dread of a forest, was the submission of Terimoli board findings. The board constituting seven-member Gazette officers handpicked by the High Court, over the course of 17 months, painfully and rather courageously found the sanctity or otherwise of Communist rebel causes within the RedbBelt. The commission submitted their copies of findings to Bastar divisional offices, who took the risk of sending the reports to Raipur at the last moment. A perilous 6-hour journey, and about 290 kilometres to cover. After having conversed to our fill about most things under the sun, Ganesh and I were invited to have lunch with other cadets. Rabbit stew was the day’s delicacy. We all sat cross-legged on the floor inside the tribal chieftain’s hut. The rains had halted momentarily, and low chirps could be heard at a distance. Simmering hot rice and spicy Rabbit stew came as a blissful reminder of simpler things in life. Post lunch I needed to have a few final discussions with the Rebel army head. Commander, If you are fighting alongside the people and for the people, why is it that your political outfit, barring a few regions across the east, is unable to form a government by its own. Do you think the same will happen in 2019? Technology is ever changing sir. How can we not accept it? The whole world is moving towards a future and do you think it’s wise to stand still? Moving, but towards which end. When people are dying of diseases when our sisters are raped by men in power, when lack of education is limping our future, when lack of food and poverty is ruining our children, what do our priorities stand? We are doing what is needed. We are showing what could be done. You say the world is moving forward with technology. Then why are we here? Why do people look at us for basic food, education and shelter? Why does an upper caste stomp over the lower caste? We aren’t moving anywhere, dear friend. It is just an illusion. The rich are consuming the poor. Capitalism best suits them. Those whose stomachs are filled with sumptuous food will always want to spend on any luxury. Technology is that luxury. It has been marketed as an essential need, even an upliftment vehicle, which is also true to some point, but for the most part, it is just a convenient comfort, on the provision of which our nation feels proud. Your leaders tell you, ‘we have provided laptops everywhere, we have software companies everywhere, we have laid high-speed internet everywhere’, but what exactly is changing. Why does the root cause of troubled living, never go away. They sell you a fiction, friend, saying that this will empower your women, empower you because that’s what we want to hear. We need in our hearts, need to be told that you matter and you have the power to change the society in your hands. Nothing changes then. You are happy, thinking that you have the power in your hands. You’ll die with the same dream. But do nothing. Because they won’t let you do anything. You understand why we are needed? The stones hit harder. The windshield of the second jeep finally took a hit and in the darkness of the jungle crackled to pieces. The stones were just the start. As the first jeep swivelled out of control but regained the speed, it met its obstruction up forward. Thick barbwires, laid densely across the road, which could puncture the thickest of tyres. In a moment, the first jeep swung out of control, and since the driver thought it opportune to press the brake finally, got thumped from behind the second jeep. As both of them stopped just on the edge of the road, the third jeep was driven into the forest, in hope of a kutcha road to the state’s capital. But it never made its mark. The jeep was caught midway, and the driver and Nayab Tahsildar Larkoin Momba, were killed, with a dozen bullets in their chest. As for the other two jeeps, as a horde of rebels surrounded the jeeps, one of the jeeps rolled down its windows, and threw a bundle of files across, in hope that the rebels would take it and leave. Both the attacker and the victim knew what was at stake. All the files were placed on the bonnet of the first jeep, and a group of rebels started pouring kerosene all over the vehicles. Idealism took five lives that day, as all men were burned alive along with 17 months of research and compilation. The question that has been baffling many thinkers for ages now still remained unanswered. Why does idealism need violence? If the movement is truly for the people, then what is achieved by burning them alive? Does the revolution only suffice to live long on rebel? Does the rebel army only thrive on rebelling against the current norm, but doesn’t exactly want to take up the mantle of defining the norm? And finally, as capitalism spreads a propaganda of misplaced consumerism, does communism also spread the propaganda of violent means? Isn’t holding a gun in your hand, and being unaccountable for it, a sort of convenience that the deprived find comfort in? As the commander says, nothing changes. Nothing is meant to change. We all want to sleep knowing that the next day will be a better one. Knowing that we matter when we actually don’t.